Whenever you gain Armor, give this minion +1 Attack. as a FYI with Brawl 30# (Deathrattle, Battlecry, Murloc or Spell) this card does not gain attack when you cast a spell (and therefore gain armor) if you picked the spell option. Give it charge and we have a deal ! Can present heavy pressure on board, incredibly good with Armorsmith + Whirlwind combo, but it's way too slow compared to Frothing Berserker + Warsong Commander + Grim Patron combo. Dream Combo: T5 This played with Mechwarper , Armorsmith and at least 2 minions, then Whirlwind, become a 10/4. Not a bad card by any means, but outclassed by other 5-drops — Sludge Belcher, Loatheb, even Harrison Jones. 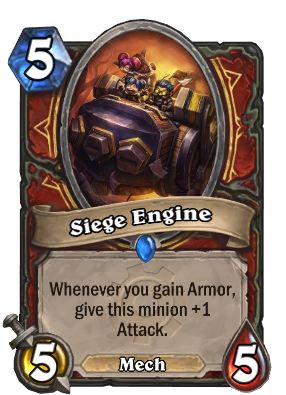 Wouldn't it be funny if Siege Engine used the Siege Tank's quotes from the StarCraft franchise? "Got no patience for sitting around!" Nice synergy but not sure I like it starting at a 5/5, could prefer it starting lower and costing less... but oh well. So with this, an Amorsmith and a Frothing Berserker on the board you basicaly forfeit your turn if you play a Whirlwind? The animations in a warrior deck are already crazy long sometimes.